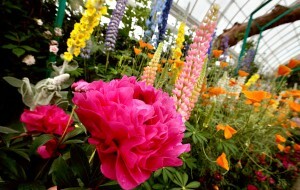 Monet’s Garden, at the New York Botanical Garden in the Bronx, is a living approximation of gardens the artist created. Color is among the last considerations in the landscape design process. Solving functional needs, activity areas, use spaces, and circulation patterns should be achieved first, with color being the patina in which the rest are painted. Vision is the first sense that we utilize to gather an impression, from which all other senses follow. The primary colors are red, yellow, and blue. From these, all other colors are mixed. The three secondary colors are orange (red and yellow), green (yellow and blue), and purple (blue and red).In the garden, this color theory was perhaps best known in the work of Gertrude Jekyll. This 19th century garden designer developed color theories in her perennial garden designs which are still influencing gardens today. The artist Monet composed his garden with the eye of a painter. If you look closely at one brushstroke of his paintings you will see several colors combined which provide the overall color scheme. Claude Monet was an avid gardener who once reflected that perhaps flowers were the reason he became a painter. How do you begin to choose colors for a garden? Context plays an important role here in the success of a garden design. Environmental influences, color schemes that are predominant in the neighborhood, and the color of your house or other site features all play a strong role in color choice. Be conscious of all hardscape material colors, such as paving, site furniture, fences, garages and other items. Color is also an individual choice that reflects the gardener’s personality and wishes.